Home NEWS Two arraigned in court for robbery with violence, assault on gubernatorial candidate. Two arraigned in court for robbery with violence, assault on gubernatorial candidate. On the dock! 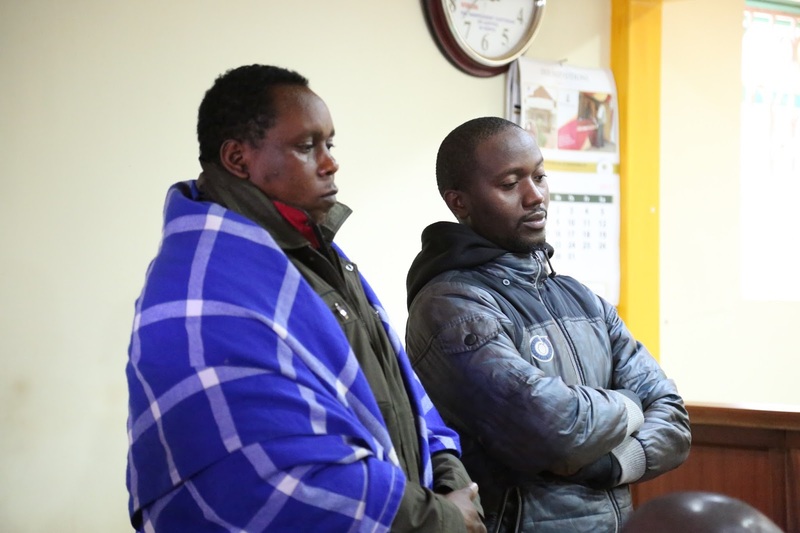 Stephen Mwangi Chege alias Habile (Right) together with Alex Mbote (Left) during their robbery with violence and malicious damage to property case at Kangema law courts on Monday. Two suspects have been arraigned in Kangema law courts and charged with robbery with violence, a week after the suspects emerged from their hideouts. Stephen Mwangi Chege alias Habile and Alex Mbote, who are both campaigners of Murang’a Governor Mwangi WA Iria, denied the charges before Senior Resident Magistrate BM Kivuti. The two were charged with various counts among them robbery with violence and malicious damage to property, that on 25th July, 2017, they, with two others not in court, attacked James Ng’ang’a Gathatwa at Kiamara village of Kangema constituency, where they stole from him a radio amplifier, mobile phone, one speaker, wallet stashed with Sh.2, 000, all items amounting to Sh.44, 500. They on Sh.300, 000 bond until today when their case will be mentioned. candidate on Mzalendo Saba Saba ticket Dr. Moses Mwangi. Two other suspects who were not lucky to escape police dragnet were arraigned in the same court last week and were released on Sh.300, 000 bond. All the four suspects have been charged with the same offences, with the complainants accusing one of them of stabbing their supporter with a knife before damaging a personal car that was among others that were in Dr. Moses’s convoy.